The original, well preserved result of the labours of Eadfrith now has a permanent home in the British Library in London, but there has been pressure to have the book returned to Lindisfarne Island, where it was written. Recently, the British Library commissioned 3 laser printed, exact copies from a company - Faksimile Verlag, Lurzen - and on Saturday 17th May 2003, one of these copies was handed over to the people of Lindisfarne in a special service and ceremony at St Mary's Church on the Island. Two BCR members were privileged to be in the congregation that packed the ancient and historic church and here are their recollections of this event. The Lindisfarne Gospels come home 'in spirit'. This was our first visit to Holy Island. We had been meaning to cross for many years, but things don't always go as planned! Recent publicity that a copy of the Gospels was due to be delivered to the Island had refreshed our interest and just a few days before we had passed the road to Lindisfarne, off the A1, as we delivered a 13 year old dog to its new home some 15 miles further north. On our way back we paused at the causeway and noted the tide times, intending to return on the following Sunday for our first visit. We both have a fascination for History, Castles and ancient Churches and Monuments. Lindisfarne has all of these. By pure coincidence we both woke very early on Saturday and decided to go that day, in time to get over after the outgoing tide had left the causeway clear. Consulting our notes we found that we could cross anytime after 8.05 am, so we decided to time our arrival for 9 am and leave home allowing 2 hrs for the journey. Now, as I said, nothing goes to plan and it was around 8.15 that we were able to leave. The journey was slower than planned and to cut a long story short, we arrived on the Island at 10.30 am, a little frustrated. This was to be a big day out - we foster for BCR and do not often get away. When we do we have to find others to look after the dogs - or take them with us. On this occasion we had already made arrangements for them to be looked after by other BCR members on Sunday, but the spontaneous change of plan had meant that our 'locums' were all called on to take the dogs a day early. Fortunately, they were all able to fit in and we left with two dogs to share the experience with us - but later than originally planned.. When you visit Lindisfarne island you have to fit in with the tides. We knew that we had to be off the island before 2.50 pm or be stranded until nearly 9 pm when the causeway was clear again. We wanted to fit in a lot - to see the village, the priory, the castle and the nature reserve and enjoy a good walk with the dogs. Our first move was to park the car and sort the dogs before we walked into the village to get an idea of the lay of the land and plan our day. The weather was not at its best - very overcast, cool and showery - but we weren't there for the weather! We were somehow first drawn towards the Priory and Museum, and decided to make that our first port of call, followed by a walk with the two dogs in the nature reserve and then over to the Castle. Before we bought our tickets for the priory and museum, we thought we would have a quick look at St Mary's Church. As we walked along the path we were overtaken by a flood of people obviously intent on getting somewhere in a hurry and curiosity led us to the church doors where we enquired as to what was happening. We were told that this was to be the official ceremony of the handing over of the copy of the Lindisfarne Gospels to the Islanders - starting in two minutes - and we were invited to attend by the lady on the door. Call it coincidence - call it what you want - but in a split second it seemed that the weeks planning, the spontaneous change of day, the delay leaving, slowness of the journey, our explorative but undirected wanderings and our curiosity had all conspired to bring us to the church door at the precise moment that a small part of history was about to be made. I do know that if we had known about the event and had planned to be there we would have had problems and arrived too late or not been able to get away at all. A bit like the characters in the film 'Close Encounters', we suddenly felt that somehow we had been invited and guided. Of course, we went in. Not surprisingly, the church was full and many were standing at the sides expectantly. We found ourselves gravitating towards the back of the church where the bell rope was being vigorously pulled, heralding the service. Strangely enough there were two seats left on the end of the very back pew on the left of the centre aisle and we occupied these. I had my partners new digital camera in my pocket and asked a steward for consent to take photo's. This was given, although I was asked not to use flash during the service. On return to my seat, I found that the space had been occupied by another late comer, so I stood next to a group of people wearing 'press' badges and against the back wall - an ideal spot to record events as it happened. I decided not to use flash at all and set the camera on 'night view'. The service began with a prayer from the Sacristy and a procession emerged, bearing the Book, with the Rt. Revd the Bishop of Newcastle, the Vicar of St Mary's, Ministers, visiting Dignitaries and Representatives following a monk carrying the church cross. When all had settled and in their place, a very accomplished young lass, Alice Burns from the family group 'Burning Bright', appeared and played her Northumbrian small pipes Her skill was superb and her music echoed emotively around the church, setting the atmosphere for this special occasion. A small image of Alice performing appears on the left. Canon Kate Tristram introduced the occasion and then handed over to the Rt. Revd. the Bishop of Newcastle who was there to take the service and accept the Book on behalf of the people of the Island. The service in itself, was simple - as becomes a celebration of the work of a monk who had, himself, sought the simple life. Prayers and Hymns had all been chosen to reflect the life and history of the Island. In many respects it would be difficult to imagine such an event being held any other way. At a point around two thirds of the way through the ceremony, Michelle Brown, Curator of Illuminated Manuscripts at the British Library made a presentation, relating the history of the Lindisfarne Gospels and events leading to the creation of the copy to be handed over. At the conclusion of her speech, the copy was handed to the Rt. Revd. the Bishop Of Newcastle and held up for all to see. The image on the right shows the Rt. Revd. the Bishop of Newcastle, having received the copy of the Gospels. The image below shows the Vicar of St Mary's holding the book in reflection and prayer. 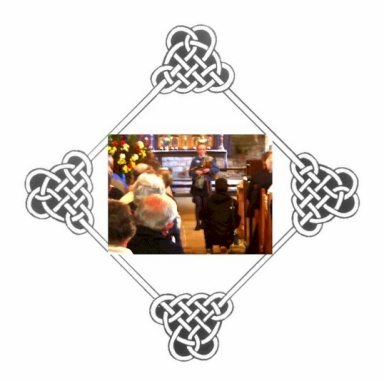 The copy of the Lindisfarne Gospels was then ceremoniously taken from the church in procession through the village to a reception at the village hall. 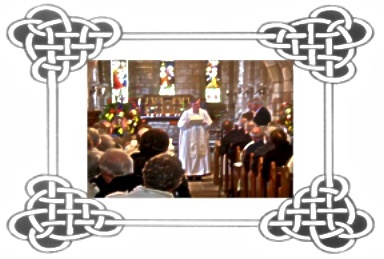 The image below shows the book being held aloft by Father Damion as it passed in front of us on its way out of the church. The original book of the Lindisfarne Gospels left the island in 875 AD, when the monks finally gave way under constant Viking raids and abandoned the original Monastery. After many moves the book came to rest at Chester-Le-Street in County Durham where some final additions were made in English, above the original Latin script of Eadfrith. It finally went to London. 1128 years later - some 1305 years since work on it began, this wonderful hand crafted work has come back to the island - at least in spirit - in the form of this exact replica. At the time, its creator, Eadfrith, used state of the art methods and tools to painstakingly write and illustrate this volume. In the 21st century, state of the art methods and tools have been used to copy Eadfrith's every pen stroke, dot and mark in order to produce something that, although new, is spiritually very ancient and a link with our Christian past and history. Unlike the fragile and priceless original, this copy will not have to rest behind glass. It can be handled, touched and held. We feel very privileged to have witnessed this event. How fate had put us in the position to do so is still a mystery. Like many these days, we lack Eadfrith's faith and only normally attend a church service for weddings or funerals, but he may have called it the will of God. Perhaps we may be privileged again and bear witness to the return of the original Book of the Gospels to the Island it truly belongs on. We will be there if we can. We have to go back - we still haven't visited the Priory or Castle! The Lindisfarne Gospels, an Anglo Saxon work of art and beauty from the cradle of early Christianity in the North East of England. Wet weather did nothing to quell the spirits of the congregation as they process towards the village hall. A pause on the doorstep of the hall for the waiting cameras. One of the 5 hand illustrated 'carpet' pages in the book. Want to know more - check out the links below.